The good news: back to school time! Bad news: let the scheduling games begin! For the Corder family, one of our new school year traditions was a family meeting with the big calendar getting everything into place. After putting in the NNA (Non-Negotiable Activities such as church, scouts and Kaju) we put in study time. Then came the extra-curricular debates. Piano, violin, abacus, ultimate Frisbee, track, Academic Decathlon, theater arts, student government…. all worthy activities certainly deserving of coveted schedule time. We quickly learned that while kids may WANT to do everything, they don’t NEED to. Over-scheduling was the one sure-fire way to limit success and accomplishment. Too many activities would make them grumpy, tired and instead of doing WELL, they would barely get by. So, we discussed individual and family goals, made pro/cons lists, surveyed their abilities (let’s face it, no one in the Corder family was ever going to get a basketball scholarship) and put the plans into action. Through that one process my kids learned about sacrifice, priority, desire, and so much more even though they did not get to do every single thing that peaked their interest. For all our Kaju AZ students, we know this time of year can be challenging trying to figure it all out. Don’t stress because of your child’s Kaju AZ classes! We simply ask for two classes a week (one hour for Dragons and two hours for Juniors). Those two classes a week help maintain material retention and keep fitness on track. 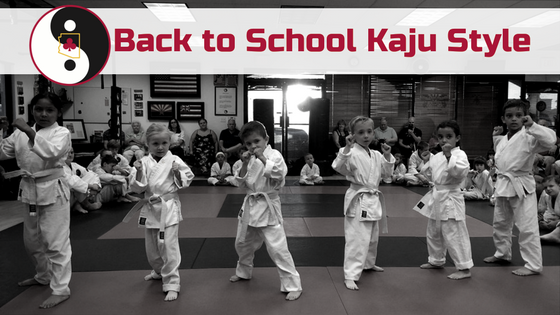 The time that Kaju AZ students spend in class helps them not only learn martial arts skills that may someday save their lives, but also improve grades, learn sportsmanship, respect, self-confidence, discipline, and gain life-long leadership skills. And so much more! Parents, don’t forget we have homework areas at both locations so if your child needs to be dropped off before or picked up after their class, they can get their work done while waiting! So, as my Grandma LaRue says “You can do it all, just not at one time.” Here’s to another successful school year!